Home Archive DAN THE FAN – Can Town overcome their inconsistent form? AFTER earning three precious points away at Tranmere Rovers ten days ago it looked as if something had changed and fans could see some hope for this season. But ever so predictably Richie Wellens side let themselves, and the 6,000 fans in attendance down last Saturday. Town now find themselves seven points off the playoffs and just four points from sixteenth, which is a sad but truthful reflection of a season where we seem to take one step forward followed by two steps back. Saturday’s 1-0 home defeat to Crawley was a collective failing from every Town player on the pitch, but unfortunately some struggled more than others. In his first two appearances for Town Candice Carroll played and adapted well to being asked to play a couple of positions, as he started out in central midfield and then to moved over to right-back. Despite enjoying success in that position against Tranmere the Brentford loanee had an absolute shocker at the weekend as he once again started the game at right-back. Everything he seemed to do went wrong from kick-off to the final whistle, from consistently losing possession of the ball, to his failure in making a simple pass to a teammate. The strangest thing was the manager’s response and not replacing him at some point during the game; I appreciate he won the penalty late in the day, but it was clear Richie Wellens should’ve made the change. There is no doubt Carroll is a talented player, and every professional has a bad game, especially someone so young in their career, but he still shouldn’t be starting this weekend against Forest Green Rovers as Kyle Knoyle should slip straight back in to deal with the threat posed by 5th placed Rovers. Despite the terrible result last Saturday there were a couple of positives to take from the game, the performances of new arrival Tom Broadbent and Luke Woolfenden. Both centre-backs dealt with their opponents well with the only blotch being the killer blow in the first half. Overall they look a good partnership and should be given time to learn and improve from each other, which will give them time to form that understanding. If Sid Nelson does return the manager’s job becomes slightly harder, but looking at the players we have now, those two should be the first choice partnership. This Saturday as I’ve mentioned Nailsworth’s finest Forest Green Rovers visit SN1 for only the second league meeting between the two in Wiltshire. With our visitors currently occupying a playoff spot, this encounter presents a huge opportunity for this current Town squad to try and close the gap on the top seven and quickly repay the Town faithful for the horror show of last weekend. 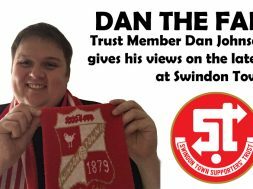 previous DAN THE FAN: Renewed hope or a false dawn?